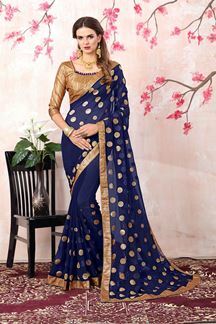 Cast a spell with this royal blue saree in sheer georgette sporting gold zari buttas along the pleats in a gorgeous outlook while pallu features scattered gold zari motifs in a stunning fashion! Red & green resham embroidery in floral patterns circles the saree all over for a complete designer feel. This saree comes with matching fabric blouse piece. The blouse in the picture is for photo purpose only. Note: Color may slightly vary due to digital photography.